I'm not sure what kids got out of the book, to be honest. The story of Louis Creed and his family, moving into a house next to an old native burial ground somewhere in Maine, works best when it covers the sentiments and secret thoughts of a husband and father. The book starts on the day Louis and co move into their mansion (it's one of those American houses that is clearly bigger than any normal house in Europe). Nerves are frayed, and Louis fantasizes about running away to Disneyland (Disneyland being a recurring theme in the book) and leaving his family and cat by the side of the road. Barely up the driveway, his new neighbour Judd Crandall pops over, just as the toddler got stung by a bee and the girl twisted her ankle and general mayhem reached its peak. 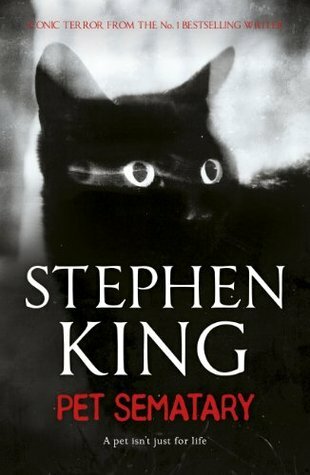 Pet Sematary has the usual Stephen King tone, that somewhat chummy, drawling, narrative voice which lulls the reader like the movement of a slow but comfortable train on ancient railway tracks. It frequently hints at things to come, sometimes a chapter or two in advance, sometimes more than that. It keeps you reading even when not much is happening to Louis or his family. Some of the glimpses of the future don't quite fit with the ending, in my mind, so there's a bit of a sense of discontinuity. To my mind, the novel is at its most engaging when King writes about the relationships between people, and their inner lives. It's at its most horrifying in a scene of mundane disaster. All the supernatural stuff, all the "horror" of the novel, is actually not exactly scary. Perhaps this is a failure of my imagination: I can find movies scary, and I can find myself scared at night when unidentified noises haunt the house or when walking alone in darkness, but books? Somehow, I rarely find books scary. Pet Sematary is no exception. If golf is a perfectly good walk ruined by that business with the sticks and balls, then King's horror novels are perfectly good mundane literary novels ruined by the horror bits. It's readable enough, in that chummy Stephen King way. It's not quite the transgressive novel King seems to think it is in his introduction, but perhaps grown ups with children and families will react more strongly to it than I did.